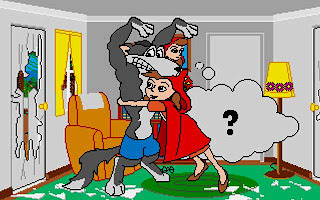 Puppy Love is an original animation I created many years ago that parodies the story of Little Red Riding Hood. It posses the question of what if Little Red Riding Hood really, really wanted a puppy? You'll find out more about Puppy Love shortly but first, a bit of history that inspired my interest in animation. Way back in the late nineteen eighties and early nineteen nineties animation on home computers really started to take off - especially on the Commodore Amiga range of home computers. Back then the king of animation, who became synonymous with the Amiga brand was a guy called Eric Schwartz and more specifically his character, Amy the Squirrel. My animation is probably going to pale at the side of Eric's but keep in mind Eric's animation, "At the Movies 3", below, is Eric really at his peak. You can watch much of his earlier work at this YouTube Channel most of which was created on the Amiga platform. I've digressed from the point of this article because I was a huge fan of Eric's work and it was really him more than anyone else that got me interested in Animation (Disney probably got me into cartooning but Eric showed it was possible to make quality animated cartoons at home - back in the early nineteen nineties). Puppy Love is not the first animation I created on my trusty but humble Amiga 500 (and later Amiga 600HD) but it was my first and only fully completed, original animated story from that era of my life. Prior to this I had animated a series of comic strips I'd drawn based on an original cat character I created years earlier, as a fifteen year old, called The Night Stalker. Eric used Deluxe Paint III and IV teamed with GoldDisk's Moviesetter software to create many of his animations so I got my hands on both as soon as I could. For those of you that have never heard of Moviesetter the easiest way to show you how it worked is to show you GoAnimate's Animation Studio. Moviesetter worked almost exactly the same way except you could fully customize your own characters and their movements as well as drawing upon a library of predefined characters and backgrounds. (for the technical minded, Moviesetter was bitmap animation not the vector, flash animation used on GoAnimate). Like Eric, I completely by passed all the predefined characters and went straight into customizing everything. In Puppy Love there is nothing that I didn't make myself other than perhaps one or two sound effects (but it is my distorted voice yelling 'Puppy!'). I won't go into much more description here as, if you have ten minutes to spare, I'd really appreciate it if you watch my video below where I tell you about some of the behind the scenes work. Everything from showing you my character design to story boarding and transferring my drawings into the computer. The video then finishes up with the full remix of my original Puppy Love animation - which I've had to painfully reconstruct because I never had any way to directly convert the animation from the original source. Compared to Eric's work Puppy Love is hardly earth shattering but I hadn't really come into my own yet. I was still coming to terms with the software, plus the lack of a scanner really made animation both a challenge and a chore. After Puppy Love I began work on a completely new animation series called Detective Duck which never got beyond some character design work and a demo of the opening titles (seen here as an animated gif file). The original version had music and the sound effect of a car coming screeching to a halt. In this case the car was the titles screeching to a halt to avoid Detective Duck running past. I do have other small samples of animation from this period, which I may post in another article, however I'm fairly certain Detective Duck marked the end of my interest in animation for many years. I'm not sure exactly why I stopped. Perhaps I just got busy with other things? 1995 was the year my freelance Graphic Design career really took off with a major client offering me a contract that lasted for many months. Whatever the reason I pretty much stopped animating my own stories until I discovered GoAnimate, by chance, in July of 2008. I certainly wasn't looking to fire up my interest in animation. Just happened to read about the site in Mashable's social media blog that I've followed for a couple of years. I'm really glad they wrote about it because it's the most fun I've had on the internet since I first found Youtube. The detective Duck looks sharp. I enjoyed your intro, nice to see your work. I wasn't into any kind of animating back then, but I can appreciate all the time and work you put into this. Hand drawing those characters with the mouse!?! Yikes! The animation "Puppy Love" was cute and fun as well. Nice Ariel view when the wolf first ran from Red. I loved Red Riding Hood's line through out the animation. "PUPPY!" At the time I didn't think anything of drawing with the mouse. It was something that I, and many digital artists just did as scanners were expensive back in the day. Wouldn't like to do it now though. Yikes from me too! !